You know you are officially pregnant the moment you’ve realized you can no longer button up your favorite pair of jeans–no matter how hard you try. And if you’re anything like I am, a good pair is one you treasure and hold on to until that last thread is practically irreparable. 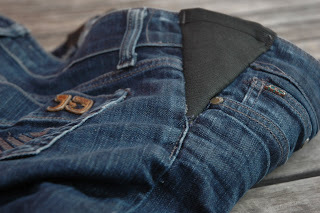 When maternity jeans just won’t do, you can invest in Denim Therapy, a service that enables you to hang on to your beloved jeans through those nine months and still be able to wear them once you are back to your pre-pregnancy self. Using a special thread selection process, each pair of jeans is stitched with expandable side inseams to accommodate growing bellies. Then once you’re ready to wear your old blues again, they can be restored to their previous condition. The cost for both services is $60–comparable to a pair of new jeans that you might settle on once you realize your favorite pair is no longer an option. And a small price to pay for an emotional reunion money can’t buy: you and your jeans. In a Nutshell: Make like Neil Diamond, and be forever in blue jeans. At a time in your life when your self image could use a little boost, you’ll take comfort in your trusted pair.